Asylamba: Influence is a strategy game based on the world of Asylamba (first game). This time it is a single-player game available on PC, Mac and Linux. Although the game is based on the same universe, the game is totally different and reinvented. This is no longer a space war, but a soft war based on the propagation of the culture of the player's civilisation. "Making your culture shine is often more effective than taking out weapons!" This game is intended for all strategy game fans. The design is clean and immersive, the sound effects are discreet and relevant, and the player's concentration is maximized. 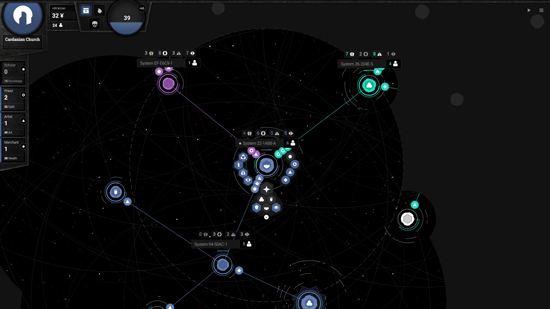 The player is carried along with missions containing enigmas. As the difficulties increase, he will have to be patient and sometimes repeat certain missions in order to accomplish them. Release - The game is scheduled for release on Wednesday, May 23 at 7pm. The game will be available on Steam. Propagating the culture - Extend your power by recruiting the most famed men and women of your civilisation and send them on missions across the galaxy. Your artists will transcend the beauty of your civilisation. Impose your religion: send your priests to spread the one true faith, yours. Your scholars will be an ideal tool to show the rest of the world the knowledge your people hold. Once your traders are on location, buy everything, planet after planet. Erect to impose - Keep conquered systems under control by building grand buildings that reflect your civilisation. The Citadel of the Arts, the Manufacture, the Astroport or the Monolith will be welcome havens for your emissaries. Building the Crypt will protect you from outside influences. The Embassy will bring you prestige. And finally, why not dare to build a Dome to defend your faith or a Holotheque to preserve your knowledge. No glory without prestige - Accumulate prestige and give your empire the opportunity to accomplish great things. Plan the assassination of an opposing emissary, raise funds to support your expansion or trigger a coup to turn the situation around. Sector by sector - Your accomplishments will happen progressively over the course of various planned missions. Many enemies will get in your way and you will have to use various strategies to get out of tricky situations. Sector after sector, take control of the galaxy. Campaigning for victory - After earning your stripes as a general of the great Imperial Order, play other characters and factions. Step into the shoes of a great dignitary of the Church of Cardan seeking to emancipate himself from the imperial yoke. Use your technological know-how within the very erudite Province of Aphera. As you wander, you will face the Kovahkarh Swarm, the rich Seldarin League, the Neo Humanist dissidents or the fanatics of the Magotic Cult.